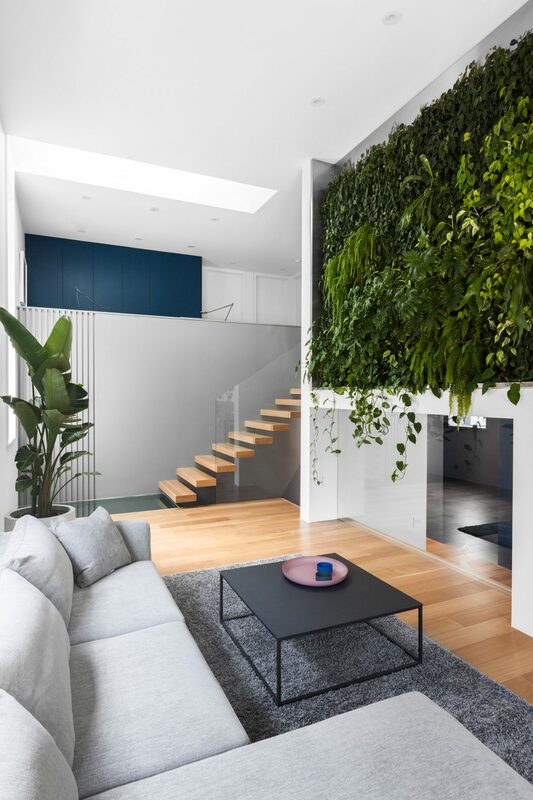 The green wall is a fascinating and innovative feature of the living room. It is suspended over the opening that connects the space to the den. 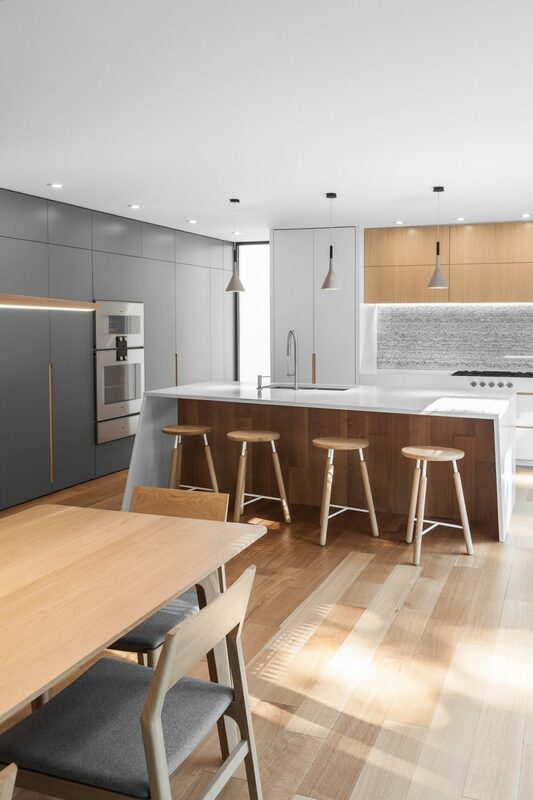 This is a tale of transformation of a two-storey brick house in Outremont, where tradition and trend reside together. It is also the story of limits and light – how to eliminate one and incorporate the other. 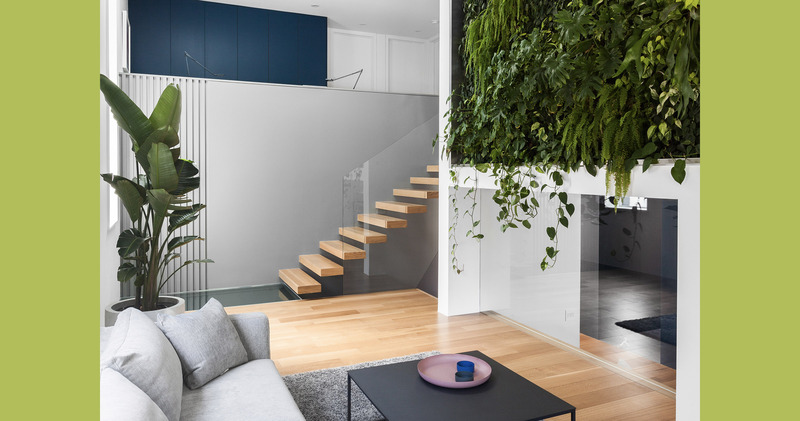 Oh, and it’s also about a green wall – a living, lush and luxurious show-stopper that might just be the next big thing in modern residential spaces. This story begins with a professional couple from South America with two children in search of their first house. “We went looking for a house to renovate completely and create a space we were comfortable with,” one of the owners, a doctor, explains. They settled on a home built in the 1940s that had all the basic elements they were seeking: a south-facing backyard, the right interior space and lots of natural light. But what was more, all these essential elements could be improved upon. So they bought the house with the plan to do just that. 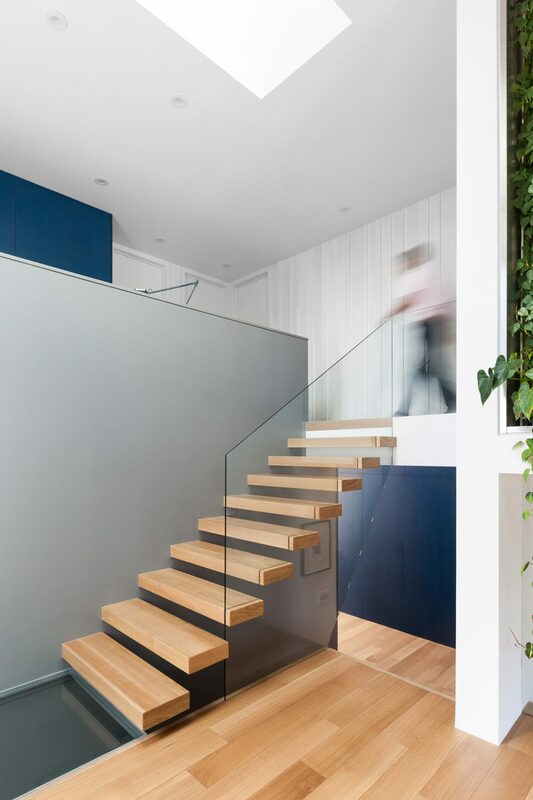 The floating staircase leads to the open second floor, where the office has a full view of the living room and the green wall below. 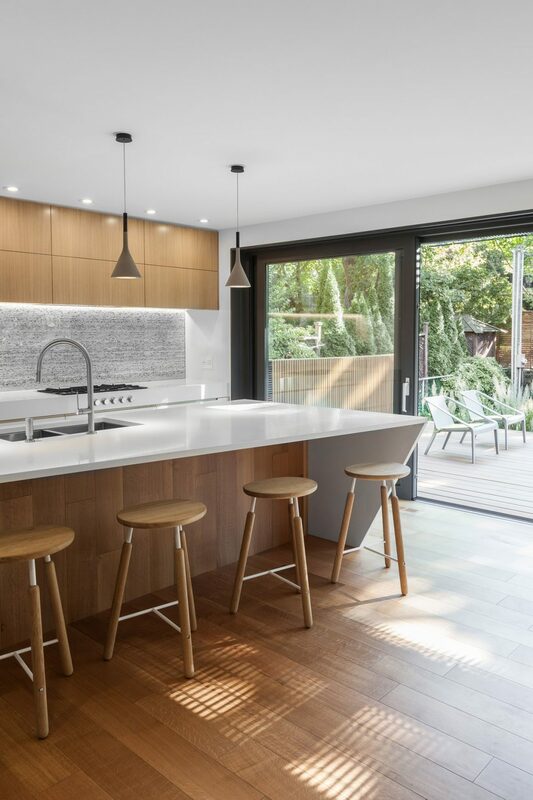 “For them, sunshine was important,” explains Stéphane Rasselet, the lead architect and owner of Nature Humaine, the Montreal architecture firm that designed the home’s transformation. To increase the amount of natural light that fills the space, Rasselet installed a 26-foot-wide wall of windows on the back side of the house that opens to the backyard. The four-panelled floor-to-ceiling vitrine with two central panes that offers access to the garden, frames the main living area of the house – the kitchen, dining room and living room. He also installed a skylight above the living room and stairway. But it was not just any skylight. This roof window, which opens by remote control, measures 30 inches wide and eight feet long. “The idea was to bring natural light in, and bring natural light to the green wall,” Rasselet says. The semi-transparent panel opens, connecting the lower den to the living room. It is made of a thin sheet of powder-coated steel that has been perforated with 18,000 tiny holes, and can be opened or closed. But he admits that the wall was his wife’s idea. “We admired many green walls like this, but they are in commercial settings, not residential buildings,” he says. The kitchen is filled with natural light thanks to the 26-foot-wide patio door/wall that warms the white oak floor. Another notable feature of this house is that its design eliminated most of the full walls. 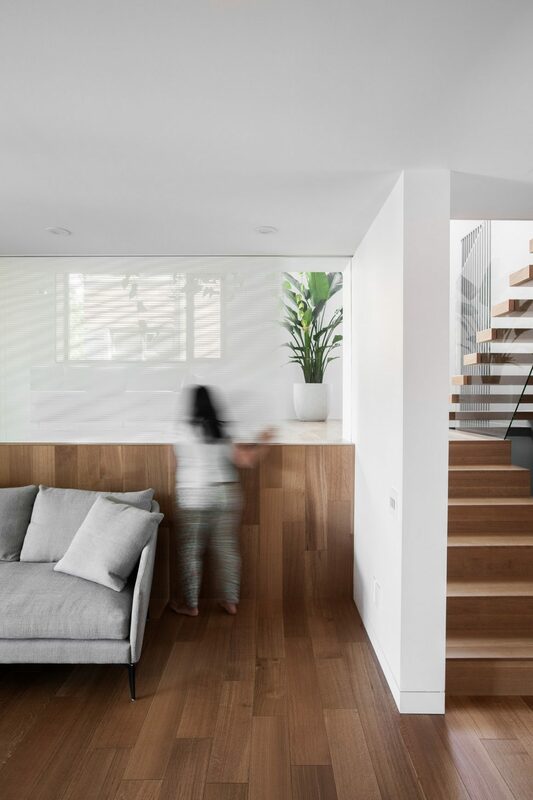 In their stead are open rooms and spaces divided by partial barriers – such as the semi-transparent steel sliding panel between the living room and the den, which is situated on a slightly higher level, above the garage. 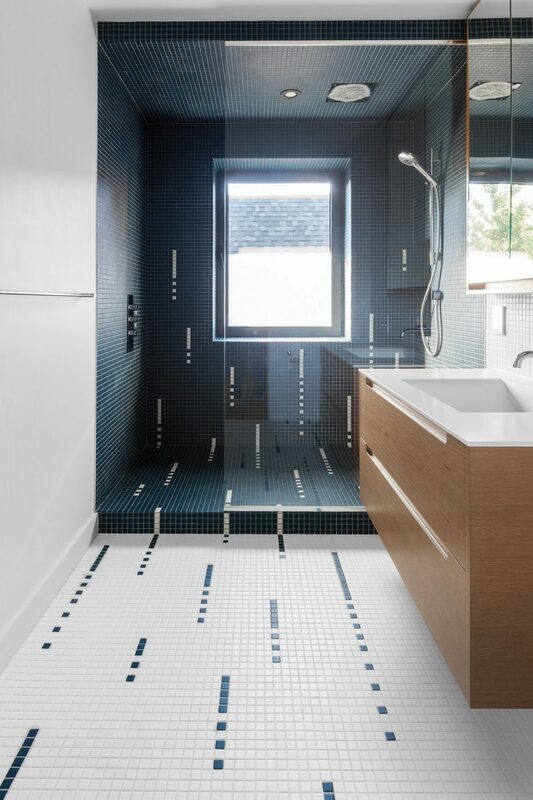 The children’s bathroom features a large shower with a window and blue and white tiles that create a pattern on both the floor and walls. 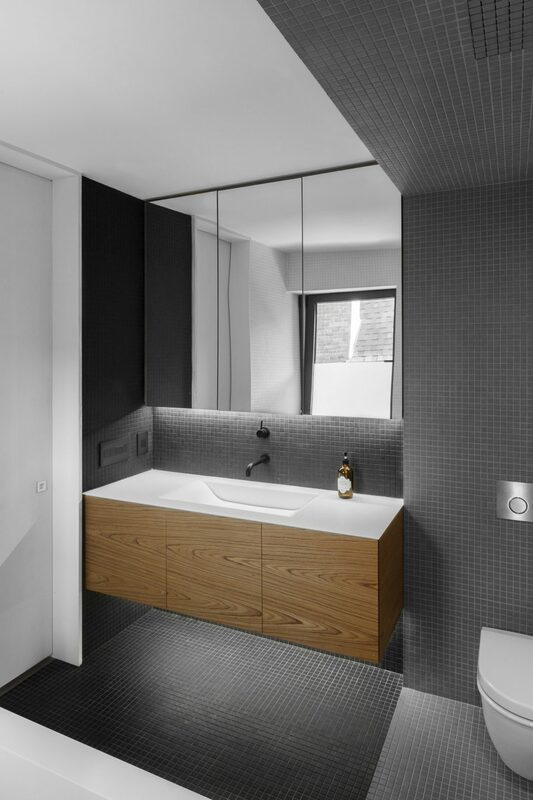 The limited colour palette of natural wood, greys, whites and blues that is used throughout the house is continued in the second-floor bathrooms, including the master ensuite that features a floating teak vanity. The effect creates a cohesive whole. 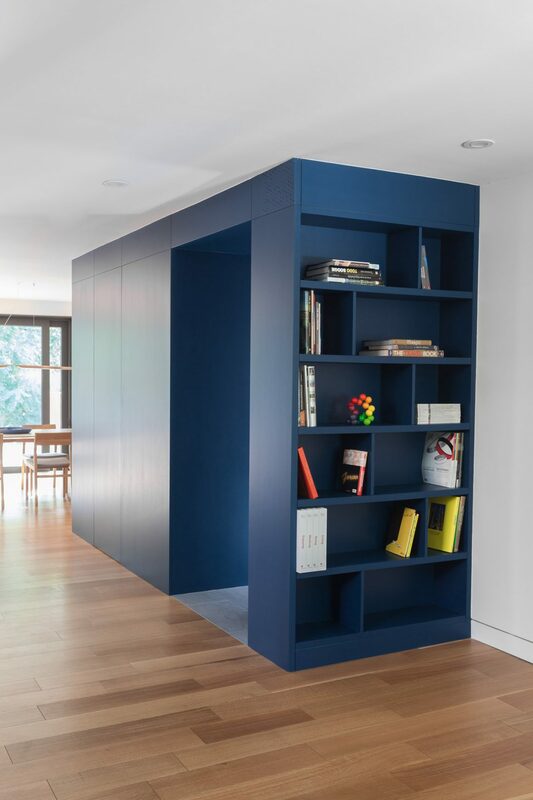 This blue block includes access to the front entrance vestibule, and incorporates storage space and a small powder room, while providing shelf space that fronts the living room. It’s a place where every member of this family of voracious readers gravitates to when they curl up with a book, his wife adds. “This is our first house, and unless something exceptional happens, this will be our last house for a long, long time,” she says.